If you wish to complete your order securely using PayPal, proceed below, otherwise send an E-mail request here. 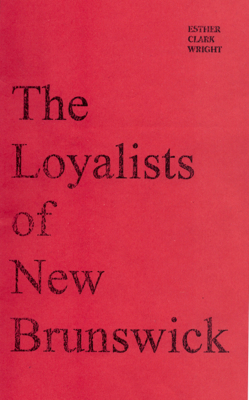 The names of the Loyalist ancestors in this book may be viewed by clicking here. This book has the nickname "the Loyalist bible" for good reason. We offer a high quality paper bound copy of the famous 1955 publication. Genealogical researchers will delight in using the appendix of the book. It contains an alphabetical list of the names of heads of families or single men of 18 years of age and upwards, their former home, their military service during the revolution, their first land grants, their subsequent grants and place of residence. 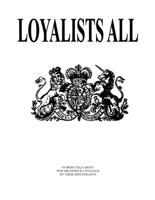 The text also tells the Loyalist story and contains too many interesting details to mention. First privately published in 1985 as a personal commemoration of the bi-centennial of the incorporation of Saint John, this book provides two 19th century records of burials in what was then known as the City Burial Ground. The first source is the only surviving record of interments and runs from 1839 to 1847. The second source is the book Loyalist Centennial Souvenir published in 1883, which lists the names of persons inscribed on monuments, many of which have long since disappeared. Over one hundred years ago a dream came true. The United Empire Loyalists’ Association of Canada was born - incorporated on 27 May 1914 - following a century of searching for a common voice to represent the memory of the Loyalists. 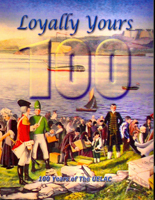 Offering a fresh overview of the United Empire Loyalists and a history of the predecessor societies, “Loyally Yours” also documents the first 100 years of UELAC. Histories of the local branches add a modern national perspective. With 100s of photographs, this special edition creates a memorable review of objects, events and personalities of our first century. While in America the Loyalists are thought of as being among history’s greatest losers, they are proudly remembered in Canada as being the founders of the modern Canadian nation. The sheer number of Loyalists who came to Nova Scotia quickly overwhelmed the slender resources of the colony and the Province of New Brunswick, so often referred to as the “Land of the Loyalists,” was born. 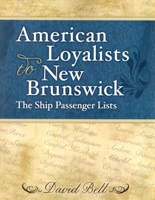 The Burdens of Loyalty recounts the tales of over one hundred loyalist refugees who were evacuated to present day New Brunswick. The rich and complex tapestry of their experiences will be explored by following the course of one refugee couple, John and Hepzibeth Lyon. As we follow the thread of the Lyons' lives through the tapestry of the revolution we learn the stories of other loyalists who they encountered while making their way to a final refuge. The deep divisions of the War of Independence appear in the day-to-day lives of the citizens of Redding, Connecticut, where brother fought brother. There are further accounts of the impact of this devastating civil war when Nova Scotia-bound ships evacuated the loyalists who sacrificed everything for a united empire,. Finally, as John and Hepzibeth settled in the wilderness of the St. John River Valley, there are tales of how their fellow war refugees began to build new lives in a land far from their homes and loved ones. What price did these displaced people pay for their burdens of loyalty? The answer is to be found in the refugee tales of this book. The refugees who fled to Canada after the Revolutionary War wished to build a distinct, non-American culture. In Saint John an elite of well-connected men, mainly from Massachusetts, allied themselves with officials appointed by Britain and sought to control the levers of power in the colony. They were opposed by upstart political leaders who, with the support of a majority of residents, bitterly fought the already-entrenched minority. The result was conflict, a war of words that soon escalated into mob violence and criminal trials. When the critics of the governor won an election, the governor and his coterie engineered a reversal of the result. Popular political leaders were charged and convicted of sedition. The hostility of colonial administrators in Canada to dissent and political opposition and their labelling their opponents -- even Loyalists -- as disloyal rebels was long lasting. This fascinating account of early Canadian politics challenges many conventional ideas about the role of Loyalists and British colonial administrators in Canada's original political culture. In 1783 many American Loyalists sailed north from New York to the St. John River valley in colonial Nova Scotia. This volume makes available the source materials documenting this vast migration. Most records were discovered at the National Archives of the United Kingdom. S&H: Shipping and handling for all books will be Can $14 to Canadian destinations and Can $17 to US destinations. Other destinations will be quoted individually.